Listen to the ladies of XOXO After Dark interview Kate Meader! Abby, Lauren and Kate discuss St. Patrick’s Day in NYC: awesome city-wide party, or just a chance to watch amateurs vomit in the streets? Then we explore the classic historical romance, Bertrice Small’s SKYE O’MALLEY, and talk about our new fave YouTube treat: Disney Princesses throwing down in an epic rap battle. 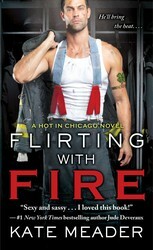 Lauren interviews debut author Kate Meader and chats about her steamy Irish Chicago Firefighter romance FLIRTING WITH FIRE, the first in her HOT IN CHICAGO series. Finally, the ladies wrap up with an XOXO version of Taboo with an Irish twist. This is a solid 5 Balls of Fire Episode! If you have read SKYE O’MALLEY, let us know if you agree with the ladies and your thoughts in the comments! Skye O'Malley is a self-made woman in an era where most were expected to be seen and not heard--but our heroine rises from her modest upbringing to head her own empire, matching wits and sharing beds with a host of passionate heroes--all while facing down Queen Elizabeth herself! A must-read for historical romance fans. Ladies, I must say you are a breath of fresh air. I am reading Skye O’Mally and it is a great read it is raw! Thanks for listening! And we’re so glad you’re reading SKYE…come back and tell us what you think when you’re done!